I can't resist a quiz, especially since I should be doing a few other things at the moment. But Steve Hicken put this on his blog, so I'll make it fast. 1) What five operas would you most like to see performed? This is a trick question for opera composers. I have written three operas and one intermezzo, which I hope to see performed while I'm still alive. You can read about them here. The other two would be Hindemith's Sancta Susanna, which was performed for the first time in New York a couple of years ago (and I only knew after the fact), and, though it is not an opera, I would love to see and hear Richard Strauss' ballet Schlagobers, a ballet that has various desserts as characters. 2) What five pieces would you most like to hear performed? besides a few of mine . . .
3) What five living performers would you most like to meet? 4) What five living composers would you most like to meet? 5) What five living musicians (composers, performers, writers, scholars, etc) would you most like to play three-on-three basketball with/against? I would hope to have Richard Taruskin on my team. I'm not sure if Alex Ross would be happy about playing basketball with a short woman composer. I think it would be fun to play anything, including basketball, with the members of the Liepzig String Quartet. My husband Michael, in a response to an odd Google query asking for a song for seven-year-old children about smoking, presented me with lyrics for a song for me to write with him to answer the query. Be careful. It's kind of catchy. Richard Taruskin tells us that music is essentially entertainment. He is absolutely correct, but it is, and always has been, entertaining on many levels for many different types of listeners. There is music for the public, music for the performing musicians, and music for the entertainment of heady fellow composers who want to share an elite musical language. Take the isorhythmic 14th-century motets of Machaut, which are carefully put-together musical puzzles that take a great deal of study to even begin to understand. Many of Machaut's pieces are quite beautiful, but many, especially the ones that have multiple languages and multiple meters, are extremely difficult to perform correctly. And when they are performed correctly only a well-trained ear would know. All of his motets were recorded for the first time in 2004. It is more difficult for me, as a listener, to find my way through an isorhythmic motet than it is to find my way through a piece of well-written 12-tone music. It is certainly far easier for me to play a piece of 12-tone-music than it is to sing an isorhythmic 14th-century motet. In defense of the dodecophonists who have been so vilified of late, 12-tone music is kind of fun to write. When the rules of consonance and dissonance are reversed, making dissonances the desirable intervals to use, all kinds of new musical relationships and new musical hierarchies just seem to appear. It is very liberating, at least for a while, to mess around with atonality, as long as you let yourself break the "rules" once in a while. And then it is exciting to play some music by Schoenberg, Berg, or Webern, and see (and hear) how well the system can be used. It is also really interesting to listen to how effectively atonality has been used in films, like "Planet of the Apes," and in television shows like "The Twilight Zone." But, taken out of its functional context as film music, 12-tone-music is musica reservata, and has always been. I think the big problem with atonality in popular culture (and I mean highbrow popular culture) is that people were led to believe, perhaps by the huge ego and personality of Arnold Schoenberg and the importance of people in his circle, that every intelligent person who had any kind of musical taste should fall under the spell of 12-tone music. This, of course, never happened. It is not something you just fall under the spell of like you do with 19th-century music. It is something, like reading philosophy, that you have to seek out and devote a great deal of time and study to in order to even begin to understand your way around it. You usually have to want to like it. I remember my first exposure to 12-tone music. It was when I was 10. I sang in the children's chorus for Wozzeck. We had to sing an atonal melody, but not knowing what an atonal melody was, I just thought it was strange and awkward because of the large intervals. I was in the company of other clueless children, and the people who taught us how to sing it taught us in such a matter-of-fact way that we were able to do a really good job. I remember that the orchestra shuffled their feet after we sang in the first rehearsal. Erich Leinsdorf was the orchestral conductor, and Michael Tilson Thomas was our own personal conductor. Although it scared me a lot (the knife, the water, the unhappy people), I thought that Wozzeck was an extremely cool opera. It was actually the very first opera I ever heard. A few years later, when I considered myself more musically aware, I heard my father practice a rather strange piece. He practiced it every day for weeks, and the tune stuck itself in my head and would not go away. It turns out it was the viola part of the Schoenberg Trio, only he was practicing it at about one quarter of the tempo. But, after all that exposure I was able to hear it in context. I can still sing it. But is there any 12-tone music on my music stand? No. Would I be willing to give up my beloved Beethoven in favor of Schoenberg? No. Would I go out of my way to hear a performance of a 12-tone-piece by Schoenberg, Berg, or Webern played by a professional ensemble? Yes. Would I ever consider learning and performing a 12-tone piece? Yes. I just finished watching Copying Beethoven, which suffered from being historically inaccurate, having a horrible script, and having actors and actresses who spoke in a stilted style to suggest that the film was set "back then" in a "foreign" place. The costumes and sets were excellent though, as was the camera work. Ed Harris, the actor who played Beethoven, even managed to look plausible playing the violin. He was shirtless (he was for a good chunk of the movie), and if there were a set of other arms and hands playing the subject of the Grosse Fugue on the violin, I didn't see them. The piano he used sounded pretty authentic, but the representation of him as being someone who could not hear was very inauthentic. Musically speaking, the movie had some excellent performances. The Kecskeméti chorus and orchestra played a great "hearer's digest" version of the 9th Symphony, but the addition of the pseudo-love interest copyist, who reminded me a little of Tinker Bell, sitting in the middle of the orchestra showing Beethoven what he should be doing as a conductor, made it hard to appreciate the excellent camera work and enjoy the performance of the piece. I wish that the DVD had larger print in the credits so that I could have read that the excellent string quartet was the Takács Quartet (I had to consult Amazon). The IMDb lists all the drivers, gaffers, and boom operators, but they neglect to list the real stars of the film, the Takács Quartet. There are times when I am really grateful that, as a community college instructor (which I am on Tuesdays and Thursdays from 8:00 until 2:15, with breaks for practicing and lunch), I get to teach a course that has material that cannot be "dumbed down." I do incorporate certain elements of "history lite," "analysis lite," "theory lite," and "musicology lite" in my highly generalized commentary, but most of the class time (75 minutes) is spent listening to music. That means that the students who have come to all of the classes so far have listened with guidance to between 1000 and 1200 minutes of music, or 18-20 hours. And the music is not "music lite." It is the real thing. There are no cliffs notes. There is no way to "skim." When a performance is successful it goes "in" to the prepared mind, like wine goes "in" to the flavor of prepared vegetables when de-glazing a pan. By the time we reach Beethoven the students have had the maps of classical forms outlined for them so many times that they can begin to follow the structure of individual movements. They can also, in a small way, understand the fact that every Classical ("Classical" with a capital "C" refers to the Classical Period) piece they hear deviates in some way from what we might call the "norm." They also have a small-but-functional vocabulary of musical terms, so that when I point out something that is fugal, for example, they understand what I'm talking about. I like to introduce Beethoven to my students by way of his string quartets, outlining circumstances in his life and work from Opus 18 through Opus 135. Then, in the next class, we go on to his piano music. We usually start with the Pathetique Sonata because it is in the textbook (at least the first movement is, but we listen to the whole thing), and then we usually listen to a couple of songs, and a few excerpts from piano concertos, violin sonatas, and other chamber music. Since I found this performance of the first movement of Opus 111 played by Sviatoslav Richter, I thought it would be nice to follow the structure of the String Quartet class and let them hear Beethoven's last piano sonata. Listening to this performance is like reading (and understanding) Faust in the original, or watching a great performance of King Lear. And then we followed it with this wonderful performance of Coriolan conducted by Carlos Klieber. I felt a little guilty about filling my students' hearts and minds with such substance (particularly the students in the 8:00 class), but I did wonder if during the rest of the day some of them--or even one of them--might have had the fugue subject of Opus 111 pounding in his or her head and heart like it did in mine. And maybe yours. A comprehensive list of significant voices in contemporary music would include Franghiz Ali-Zadeh of Azerbaijan, Chen Yi of China, Unsuk Chin of South Korea, Sofia Gubaidulina of Russia, Kaija Saariaho of Finland, and Pauline Oliveros of the United States. Composition has also ceased to be exclusively male; the preceding six composers are all women. Ross must know that composition has never been exclusively male. What was he thinking when he wrote that statement? Since Ross doesn't say anything in the book about Ali-Zadeh, I'm putting a link to her here (this is also the first I have heard of her). Unsuk Chin is named on Ross' list, but like Ali-Zadeh her only reference in the index is to the list of women on page 516. Kaija Saariaho made it onto two lists: one of women and the other of Finns, but there is nothing in the book about her music or the music of Chen Yi. To his credit, Ross does have part of a sentence about Pauline Oliveros on page 492, which she shares with Morton Subotnick, and he does write a bit about Sofia Gubaidulina, though mostly in relation to the circumstances of Shostakovich's life in Soviet Russia. He does, however, devote nearly a whole paragraph to Gubaidulina, and in it he (very briefly) describes two of her pieces. Aside from a few references to performing musicians (Billie Holiday, Björk, and Bessie Smith, for example), all the rest is men. For another review of the book I would suggest Charles Shere's view from the Eastside. If you have the time, and you'll need a lot of it, read this hefty review by Richard Taruskin that is in the current issue of The New Republic. "What draws listeners to music--not just to classical music, but to any music-- is what cannot be paraphrased: the stuff that sets your voice a-humming, your toes a-tapping, your mind's ear ringing, your ear's mind reeling. And that is not the kind of response anyone's books can instill. It is picked up, like language, from exposure and reproduction, which eventually lead to internalization." I think it is time to head to the library and take a serious look at The Oxford History of Music. The people at Farrar, Straus and Giroux deserve a huge round of applause for promoting The Rest is Noise so effectively. Subsequent encouragement from the musical blog world led me to buy the book on Amazon, though I was planning to wait until it came out in paperback. It is very well written, and makes a lot of cultural connections. I believe that this book will increase the awareness of music's presence in the history of the 20th century. I wish that Ross had given a little more than a paragraph to Nadia Boulanger. I wish he had mentioned Lili. There are a couple of paragraphs on Ruth Crawford Seeger, with a reference to her biographer Judith Tick, and there is a paragraph about the Princess de Polignac, but there is no mention of Elizabeth Sprague Coolidge. Important 20th century composers like Louise Talma, Joan Tower, Lucia Dlugoszewski, and Ellen Taaffe Zwilich are also overlooked in Ross' 20th century. Germaine Tailleferre's name is mentioned as one of "les six," but Ross does not write anything about her or her music. I know that there is not space in a book like this for everything, but it would be nice for intelligent people who are new to what I also don't like to call "classical music" to have a sense of the gender equity that started in music during the 20th century, and it would be nice to have the kind of public cultural recognition that will help it to continue. While visiting the St. Louis Art Museum yesterday, I was struck by the thought that contemporary music has finally "made it," as far as the record (literally, I suppose) goes, into a realm where it is as accessible as visual art. Pieces of 20th century art that are a part of a museum's permanent collection can be visited again and again. For example, a 15 or 20-year-old sculpture in the St. Louis Museum that is made mostly of broken glass moved from an inner gallery to the museum's foyer, but it is still the same. Its material hasn't changed. Its "meaning" (according to the artist) hasn't changed. But I have changed and grown since the first time, and even the last time I saw it (along with all the other works in the permanent collection). Whether I like it or not, that sculpture is a part of my life. It is the same with recordings, particularly recordings of music written in our own time. Now that we all have so much current music accessible to us on recordings, those recordings become the unchanging "sculptures" that measure who we are. Various styles of 20th-century music vie for position in what will eventually be called "posterity." As we hear more and more recordings of music by the many lesser-known composers of the 20th century who went about their business without trying to be radical, we realize that atonality, serialism, electronic, and chance music could be thought of simply as experiments in musical organization that composers used (and still use) as mediums for expression. Performers, just like performers of music from previous centuries, use contemporary compositions as vehicles for their own self expression. Some music written using these techniques is genuine and engaging, and some of it, like what we sometimes see when one visual artist dabbles in a technique foreign to his or her customary style or medium, can sound out of place or downright phony. Also, people with little musical talent, like visual artists with little artistic talent, can have easy access to the materials necessary to create something that can pass for music (because it operates in an aural medium) and make a big sound (with amplification) or a big impact. This wasn't something "available" in the days before recording technology. Still, like a visit to a museum, listening at various intervals of our lives to recordings of contemporary music helps us to measure our growth as listeners and recognize our limits, likes, and dislikes in a way that no other inhabitants of any previous century, who were not musicians themselves, have had the chance to do. Because of this always-accessible "aural museum," contemporary music is finally attaining an equal status to that of contemporary art. I grew up during the age of awareness about early music, and as I started to learn more and more about "correct" baroque articulation in the 1970s and 1980s, and developed a reverence for the "urtext" as the best source and the best path to musical truth, I developed a kind of disdain for most of the editions of baroque music that were available during the 1940s, 50s, and 60s. It might have been because the flute editions were often filled with thoughtless articulations and dynamics, particularly when the editor was Jean-Pierre Rampal. I assumed that violin editions would have the same lack of insight, but last night I proved myself very wrong. I am working on the Bach C minor Sonata for violin and harpsichord, BWV 1017, which I am performing with piano next month. Rather than try to pretend the piano is a harpsichord, and that I am playing a baroque violin, our approach is to play the piece as well as possible using modern equipment. I have been futzing with the bowings of the opening Siciliano, seeking out alternatives to the printed bowing, which I imagine is not Bach's since the edition we are using is not an urtext. Last night I decided to tape record myself, and to my horror and shame I found that I was making all sorts of false accents, and I failed to sustain dotted rhythms properly when I applied bowings that I thought were "stylistically correct." I tried bowing the passages in question in several different ways, and my tape recorder revealed glaring errors with each bowing alteration. Then I tried the "inauthentic" printed version, and my false accents and rhythmic instability disappeared. My guess is that this part was edited by a very smart violinist who knew how to make the violin do what the music asked it to do. Fugavergnügen, or the love of counterpoint, is a term I thought up when I was writing a review of some chamber music by Roy Harris. Bach had it, and so did Mendelssohn, Glazunov, and Reger. Schubert had his Fugavergnügen cut off: he had unrealized plans near the end of his short life to study fugue writing. Hugo Kauder, the composer I quoted below, had serious Fugavergnügen. People even referred to what he liked to write as "Kauderpoint." When Kauder moved to Vienna from Moravia in 1905 to study engineering, he spent most his time studying newly-published scores of Josquin and other Flemish composers of the Renaissance that were in the Imperial Court Library. He kept writing counterpoint while his Viennese contemporaries were becoming famous for abandoning tonality. Kauder kept writing counterpoint after he moved to America in 1940. In 1960 he wrote a textbook on counterpoint that I am eagerly awaiting to arrive, along with a bunch of his music, by way interlibrary loan. For those of you who, like me, have Fugavergnügen (either as listeners, practicing musicians, composers, or all three) I'll let you know all about my Kauder experience. Just for the record, the only professional recording of Kauder's music (so far) is by the Euclid Quartet on Chandos. If you look at the worldcat you will see music for all kinds of instrumental and vocal combinations. "A wrong note is a lie." Last night I played in the orchestra for a really satisfying performance of the Barber Violin Concerto with Tim Fain as the soloist. After the concerto Fain played a stunning encore by Kevin Puts: an excerpt from "Arches" for solo violin. During intermission many of the violinists in the orchestra asked Fain about the piece. Playing a newly-written piece as an encore after a familiar concerto is really a great way to expose the audience to the newest part of the ever-expanding repertoire, but there is a hidden perk in the experience when the members of the orchestra get excited about the piece, and want to learn it themselves. Sometimes it seems that I need to jump backwards through hoops in order to get my community college students to pay attention to what they are listening to, but I have finally learned that getting someone to pay attention for the length of time that a movement of a piece might take is not the same as having that person (or those people, in this case) get into the habit of paying attention. It is the habit of playing attention that ultimately allows people to get the most out of life and to appreciate the wonders of the world around them. One naive hope I have is that listening to music carefully as a group might make a kind of "light bulb" go on for my students; but I am resigned to admit that it is only through practice and freedom from distraction that people can learn to pay attention to what they are doing when it is necessary to do so. 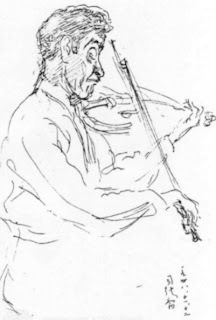 My other naive hope is that through listening to music with an ear pointed towards its emotional content, people who ordinarily would not let themselves be connected to deep and complicated emotions would find comfort and freedom in "feeling" through the emotional expressions of great composers and performers. So many of my community college students seem distracted and removed, both intellectually and emotionally. I often wonder if they will ever think of the content of their music appreciation course as anything more than material to study the day before an exam. I guess the rewards from having taken a class like this might come later in their lives. I know that I can always help my private students pay attention to what is required, even if they don't always do things correctly all the time. Paying attention to what is wrong (when they make mistakes) is just as valuable as paying attention to what is right. They are eager to close the window on the rest of the world and, when prompted and encouraged, listen to their intonation, listen to the quality of their sounds, observe the function of their hands, arms, and fingers, and count. I think that they actually like being asked to focus their attention on the tasks at hand, and they seem to be pleased that I care about their progress. Then again, the are not being graded, and the only reward they get (besides an occasional sticker for the young ones) is the satisfaction of making music. I'm not a music historian, but I tend to read a lot of books about musicians and composers, and I indulge in thinking (some would say obsessing) about particular composers and their relationships to the world around them, particularly the situations that have "produced" their best works. The world of music-loving patrons asking people to write music, while it must be alive somewhere, seems to be reserved for a small segment of the composing and performing part of the musical population, and seems to be concentrated around major cities. Much of the financial part of the process is clothed in foundations and 501c3 organizations, and has moved from being a personal kind of interaction to being a public one. Back in the 19th century, Franz Schubert had a circle of friends who read poetry together. He happened to be the composer of the group, so his friends were delighted to see and hear what he "did" with "their" poetry. He kept popping out piece after piece because he was in a circle of friends who appreciated what he did, and wanted more. His song writing was as much a service to the medium of poetry as it was to a gift to his friends. He also had a group of friends (men and women) who were students of Salieri who were particularly interested in each other's music, and they were all living under the shadows of Haydn, Mozart, and Beethoven, who were only inaccessible because they were dead. Thankfully there were a few people in the business who recognized his gifts as a composer, but what really ran his musical motor was the knowledge that people wanted what he could produce, and producing it made him happy. Alexander Glazunov was part of a circle of composers who were all students and friends of Rimsky-Korsakov. Every Friday Glazunov and his friends would go to the home of Mitrofan Belyayev, a businessman who made his fortune in lumber, and play string quartets (Belyayev usually played the viola) by Haydn, Mozart, and Beethoven until the wee hours of the night, and then they would eat. The composers who took part in Belyayev's Fridays were expected to bring pieces of their own, and they would be played. Glazunov wrote fantastic chamber music as a result of these Fridays. Belyayev started a publishing company to showcase this newly-composed Russian music. He did it because he loved music, especially Russian music, and he had the financial means to share this love for music with people outside of his circle of friends, outside of Russia, and into the future. The Princess de Polignac was totally dedicated to music. She studied organ with Nadia Boulanger, and she had the financial means to support the composers she admired by asking them to write pieces of music to be performed for her in her home. I imagine that she felt like her "salon" could be sort of a like a court in the Renaissance, or the court of Louis XIV. She was equally devoted to what was then called "ancient music" (the first modern performance of Rameau's Dardanus was in her home, and she financed the first recordings of Monteverdi) as she was to contemporary music (she commissioned music from Stravinsky, Poulenc, Ravel, Satie, Tailleferre, Weill, and a slew of other composers), and helped the performing careers of people like Clara Haskil and the whole of the Ballet Russe. She had two quartets of Stradivarius instruments in her home, and invited young musicians to play them for her and her friends. She particularly liked Beethoven's late quartets. The musicians who came to her house were paid to play, and they got to play on fantastic instruments and eat great food. Elizabeth Sprague Coolidge began her life as a patron by holding a contest to increase the viola repertoire so that her son would have more music to play. She was more of a "professional" patron than a social one. She didn't really seem to care about the social aspects of music making, though she enjoyed having personal working relationships with the composers and ensembles she worked with. A frustrated composer herself (being an upper-class woman in the United States during the early part of the 20th century, she was not encouraged to continue her composition studies) she put her energy into promoting the work of composers she admired. She paid Gian-Francesco Malipiero to make the first modern editions of Monteverdi's madrigals (the ones the Princess's friends used to make the first recordings), and she started the chamber music series at the Library of Congress, requesting string quartets to play entire cycles of Beethoven quartets. Following the example of Coolidge, perhaps, we now have people and ensembles who are looking for new music to play--particularly ensembles made of unusual instruments. Commissioning music seems to now be ensemble-specific, but it tends to be, as far as I can tell, initiated by performing musicians who ask organizations for money, rather than by individual people who are devoted to music, but do not play professionally themselves. Finding performance venues for new music is also difficult unless an ensemble has personal connections with a school or concert series, or the composer is extremely well known. We also have academia, which should be (and I imagine sometimes is) a haven for social-musical and artistic-intellectual interaction. People in some schools must get together and talk about poetry, and there are certainly composers in groups like these who would want to set contemporary poetry to music. Unfortunately for composers, poetry that is published is protected by copyright, and setting it to music would involve legal complications with public performances. Publication, because it would involve permission, which often translates into money, would be impossible for most composers. The musical possibilities for our current literary culture are seriously limited. Academic situations also offer a huge range of music to hear: music from all over the world, music that celebrates tonality, serial and minimalist music, music that incorporates technology, "scholarly" music that embraces a bunch of popular styles, jazz, and, in some places, music written by students and members of the faculty. What is new, as we can see from new music blogs on line, is both varied and plentiful. The shadow of Haydn, Mozart, and Beethoven is something that many people involved in new music encounter only occasionally. There just doesn't seem to be time for everything we have on our musical plate. In 1816 Franz Schubert kept a diary, which he wrote in from time to time. He was very much in love with a woman named Therese Grob, but because he didn't make enough money as an assistant schoolteacher to get married (there was a law in Vienna that required a man to make a certain amount of money if he wanted to marry), they had to part ways. "Man resembles a ball in play, subject to chance and passions. . . . He is like an actor on a stage who plays his part as best he can. If the part suits him, he plays it well; but his success in the eyes of others is of no matter, as their response is colored by their mood at the time rather than by the excellence of the performance." "Happy is the man who finds a true man-friend; but happier still he who finds a true friend in his wife." "These days matrimony is an alarming thought to an unmarried man; if he does not marry, he has to settle for misery or gross sensuality [one could read that to mean either being celibate or going to prostitutes]. Monarchs of today, you see what is happening an do nothing. Or are you blind to it? if so, O God, shroud our senses and feelings in numbness; but remove the shroud again one day without lasting harm." "A light mind accompanies a light heart; yet too light a mind usually conceals too heavy a heart." 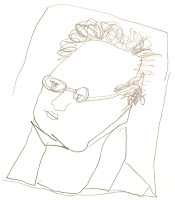 The drawing, by the way, was made on Schubert's 200th birthday in 1997 by our then eight-year-old son Ben.